The Marvel Cinematic Universe has its own set of ground rules and worldwide admirers. The two feed off each other. And that explains why the world conjured up by these films is the way it is. 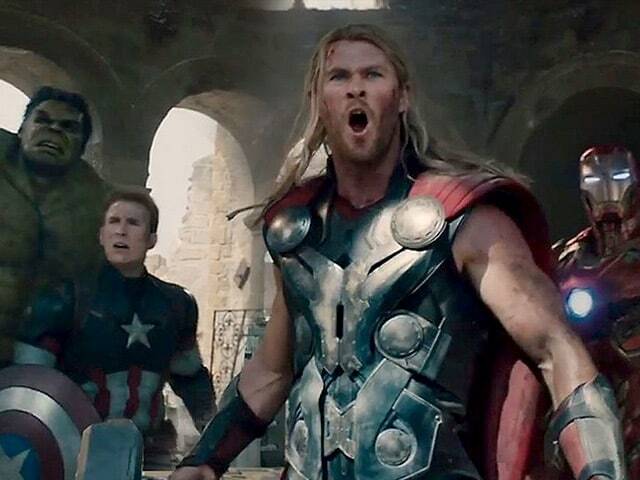 Avengers: Age of Ultron, follow-up to 2012's Avengers, springs no surprises. It is mindful of the reality of the sacrosanct formula, and it does not scrimp on delivering exactly what is expected of it. Age of Ultron is an overload of eye-popping action sequences featuring an all-star team of superheroes, plus a couple of new entrants with unique powers. Everything out here is humongous and unashamedly show-offish as the comic book messiahs go about the task of ridding the world of a renegade robot bent on wiping human beings off the face of the earth. Destruction is the keyword here: the more the merrier. Indeed, Avengers: Age of Ultron is a non-stop carnival of devastation. Flying rubble, collapsing buildings, exploding vehicles: mayhem assumes varied forms here. In the midst of the pyrotechnics and slugfests, the film pauses on a few occasions to provide passing insights into the back stories and current predilections of the key characters. Of course, there is a whole bunch of them - Thor (Chris Hemsworth), Natasha/Black Widow (Scarlett Johansson), Bruce Banner/The Hulk (Mark Ruffalo), Steve Rogers/Captain America (Chris Evans), Hawkeye (Jeremy Renner) and, of course, Tony Stark/Iron Man (Robert Downey Jr.). Avengers: Age of Ultron has two new additions, the twins Pietro and Wanda Maximoff (Aaron Taylor-Johnson and Elizabeth Olsen), who start off as adversaries (they have a score to settle with Stark) before joining the team as the lightning fast Quicksilver and the fire-hurling Scarlet Witch. For good measure, thrown into the pot are two unusual sidelights: a romantic track involving Natasha and a glimpse of the blissful domestic domain of Hawkeye and his ever-dependable family. Coming to the broader rules of this universe, even when matters turn outright outlandish, the fans of these superhero flicks who have kept the wheels turning for Marvel Studios for eight years now are conditioned not to ask questions. And that, clearly, is rule number one: you must surrender yourself to the flow while having loads of fun in the bargain. The trouble with Avengers: Age of Ultron is that neither its flow nor the fun that it seeks to deliver quite comes off - certainly not all the time at any rate. But that is not to say that it will disappoint fans of the franchise, given its complement of towering robots, twirling cars, floating ships and invincible superheroes zipping around in pursuit of their quarries. Avengers: Age of Ultron, written and directed by Joss Whedon (who wrote and directed the hugely successful predecessor as well) is strictly for those that dig this sort of low-content, hi-jinks, over-the-top cinema that thrives on the thrill-a-minute approach. While a few of the action sequences - especially the single-shot opening one in which the Avengers accomplish a task left unfinished in last year's Captain America: Winter Soldier - are indeed spectacular, the film overall seems to be devoid of soul. But that certainly isn't for want of trying. Whedon tries to keep the proceedings bright and chatty as the "earth's mightiest superheroes" indulge in friendly and not-so-friendly banter with each other and with the world at large. Many of the wisecracks, however, tend to fall right through the cracks that the characteristically bizarre plot is riddled with. Much of Avengers: Age of Ultron is the handiwork of digital artists, who have obviously worked very hard on the project. Unfortunately, there is nothing in the script that is remotely original. The arch-villain here is a destructive robot Ultron (voiced by James Spader), who is the result of a Tony Stark (Robert Downey Jr) artificial intelligence experiment gone horribly awry. This romping-stomping metallic creature believes that the only hope for world peace lies in the extinction of the human race. But with the alarmed superheroes on Ultron's heels, it can only be all-out war. The battle spans from Seoul's Gangnam district to a fictional east European country called Sokovia. From a runaway train to a flying and disintegrating landmass on which the Avengers, in a long climatic passage that lasts over 30 minutes, must prevent collateral damage and deliver to Ultron his just desserts - the film offers all manner of unabashed and occasionally endearing excess. There can be no denying that Avengers: Age of Ultron is expertly mounted and spiced up with a dash of humour. But the quality of the ride, in its totality, is uneven. Watch it for the spectacle, not the substance.